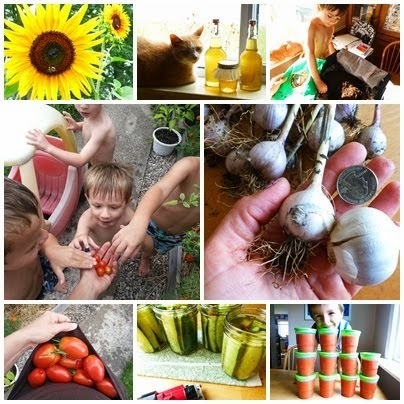 Shared on The Homestead Blog Hop! It seems I always turn to this method because it is such a tasty and SIMPLE way to preserve tomatoes. 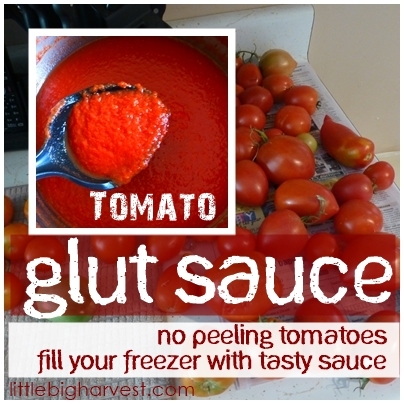 Very little mess, no peeling tomatoes, and you'll use the sauce for so many things. This is the perfect way to use up the tomatoes that pile up when you have the least time to deal with them. OR, to use up the late season tomatoes that are languishing on the counter, even those that may not be fully ripe. When you are in the middle of harvesting and preserving so many veggies from the garden, sometimes you need a method that will take care of those tomatoes easily and quickly, without hassling around with skinning them and canning them. Because of all the extra ingredients that can alter the acidity levels, this is not a sauce you'll want to can--but it freezes beautifully. The sauce is multipurpose; I like to use it in mid-winter pots of chili, mix it with spaghetti sauce for a flavor boost, and add basil and garlic for a tasty pizza sauce. If you have a lot of green tomatoes coming into the house, use the paper bag and apple trick to ripen them up a bit. Some of the tomatoes may have bumps and bruises and holes, and for this sauce, that is perfectly acceptable--just cut around them. After you have a good amount of ripened tomatoes, chop them up, cutting out the bad spots, and throw them all in a roasting pan. There are two different methods to follow from this point on; the carefree, anything goes method I learned from Spring Warren in this book , or the specific instructions described by Joan Gussow in this book . Both of these women are heroes of mine, and I own their books, referring to them often. *The consistency of your finished sauce will vary with the amount of liquid in your roasting pan (and the type of tomatoes you use--roma contain the least juice). If you have excess liquid in your pan, turn down the heat of the oven a little and roast longer, until most of the liquid is gone. OR, simply ladle out some of the extra juices, if you want. *Both Recipes freeze perfectly in these containers . *Both Recipes will need blended. Any quality blender or food processor will do the job, but I am the lucky owner of one of these . Trust me, I know just how lucky I am. The first recipe is great when I don't really want to follow any specific measurements or ingredients, and have random veggies laying around. The second recipe will blow your socks off. You HAVE to take the time to measure everything out and try the recipe out at least once in your life. Its flavor can stand on its own. Use it as marinara sauce, use it in chili, or use it as a pizza sauce (if needed, you can thicken it up after thawing it out by cooking it for awhile in a saucepan or by adding tomato paste). I LOVE using some of my frozen glut sauce in Creamy Crockpot Chicken Tomato Soup; one of our all-time favorite winter meals. When labeling the finished sauce, I indicate recipe #2 as YUM sauce. I also call this YUM sauce because while it roasts, your kitchen will become filled with the most delicious aroma you've ever inhaled. Even the kids agree on this. I can't think of a better way to end the year's tomatoes; a fragrant, happy goodbye that fills the house! Future pasta dishes, pizza, and chili, yay! Fill your roasting pan with 2/3 tomatoes and 1/3 other stuff. Other stuff can be peppers, eggplant, onion, garlic, fresh herbs, pears, plums (the sweet additions give a nice balance of flavor). Roast in a 400 degree oven, stirring every 30 minutes or so, until you have a big pile of mush. Let it cool, then blend the heck out of it. If the veggies lost too much moisture while roasting, add water while blending until you have the consistency you want. Mine always turns out pretty thick. Put into large roasting pan (I divide everything up into two 9x13 pans):Mix everything up a bit with your hands to evenly distribute the ingredients. Roast for 45 minutes or longer, until vegetables are soft. If you have a lot of excess liquid in your roasting pan, turn oven down to 300 and roast for as long as you need (for really liquidy tomatoes, I've gone an hour or more longer--just make sure to stir occasionally). Let cool and remove the bay leaf. Blend the cooled mixture in a food processor or a high powered blender until you reach the consistency you want. Recipe says it will make 2 quarts, but when I make it, I get 2 1/2 quarts, which I freeze in 2-cup portions. *Once you've tried the recipe, experiment with other veggie additions!